Overman says there's plenty of wedding planning help marketed to brides, but he hasn't seen anyone else reaching out to grooms. A movie called “The Wedding Ringer” is starring Kevin Hart as a guy for hire as a best man. In Jacksonville, as it turns out, the idea isn’t as far-fetched as it sounds. The River City is home to a “Professional Best Man” for grooms-to-be. In “The Wedding Ringer,” Kevin Hart’s character will be by a groom’s side, for a fee. 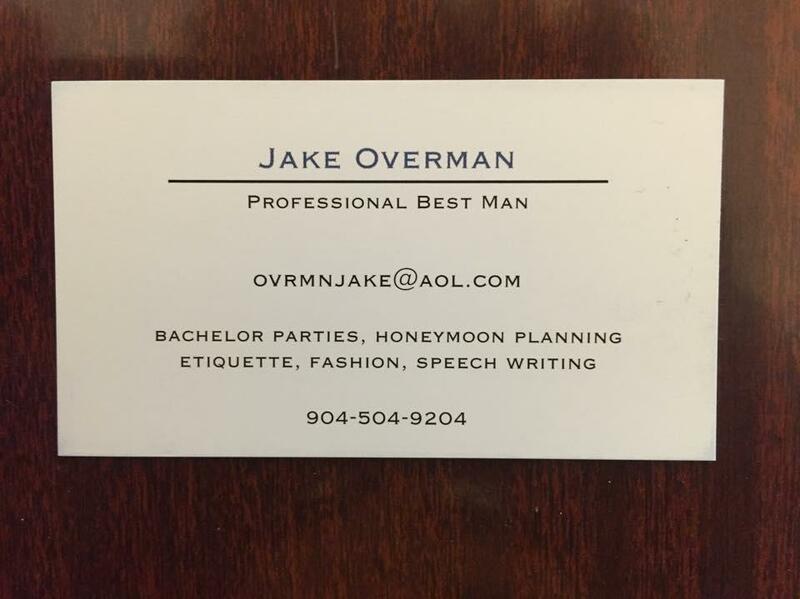 In Jacksonville, Jake Overman is for hire too, but not exactly like in the movie. “Grooms don’t really like to think about having a wedding planner, so Professional Best Man is the best title I could come up with,” he said. Though he doesn’t physically stand next to grooms on their wedding days, Overman offers help planning bachelor parties, honeymoons, wedding day fashion, etiquette and speech-writing for the actual best man. He says he’s been holding onto the idea since his own wedding about five years ago. “I needed help. A lot of guys would need help, and there’s a lot of wedding planners to help out the brides. Nobody’s helping out us grooms,” he said. Overman has officially been in business less than a month. He says he’s looking forward to wedding season just around the corner.